After an intensive workout the body expends extra energy. Researchers suspect that because of this, strength training can help in maintaining a healthy weight, and they are studying ways of increasing the ‘after burn’. One such method is to consume caffeine before pumping iron, as sports scientists at California State University discovered. After a demanding workout muscle cells need to recover. They need to replenish their creatine phosphate and glycogen reserves and restore their buffers. We’re not even talking about the recovery of damaged muscle proteins, but this process costs energy too. Researchers measure this increased energy expenditure by measuring oxygen consumption; when the latter is higher, it is called elevated post-exercise oxygen consumption, or EPOC for short. As far back as 1989 researchers showed that caffeine [structural formula shown below] raised the EPOC of untrained women after a cardio training session. But does this also happen after a strength training session? And in men who are experienced strength trainers? To answer this question the researchers devised an experiment in which 14 experienced strength athletes aged between 18 and 34 took part. The test subjects completed the training schedule shown below twice. On one occasion they took a placebo before training and on the other occasion they took 6 mg caffeine per kg bodyweight. For two days before the experiment started the subjects abstained from all foods and beverages containing caffeine. The caffeine supplement increased the intensity of the training, as you can see in the table below. 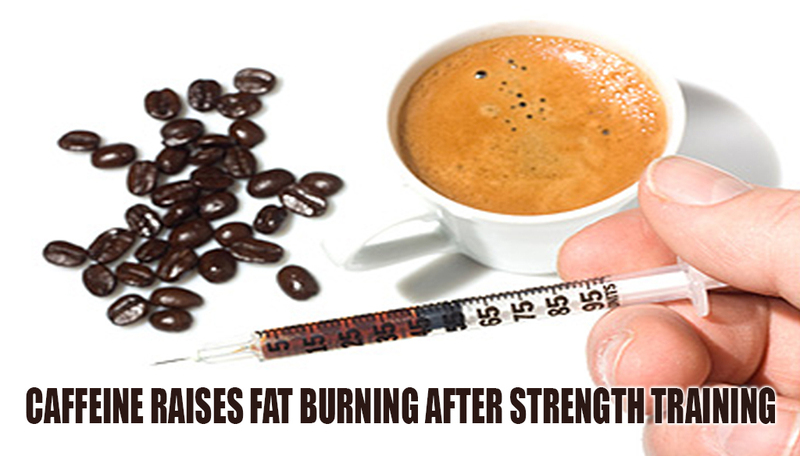 The mild stimulant raised the post-training energy expenditure by 15 percent, and also reduced the RER. That means that the body was deriving less energy from carbohydrates and more from fat. When they took the supplement the test subjects burned 24 calories more. That’s not a huge amount, in the researchers’ opinion. But of course everyone is entitled to his (or her) own opinion.